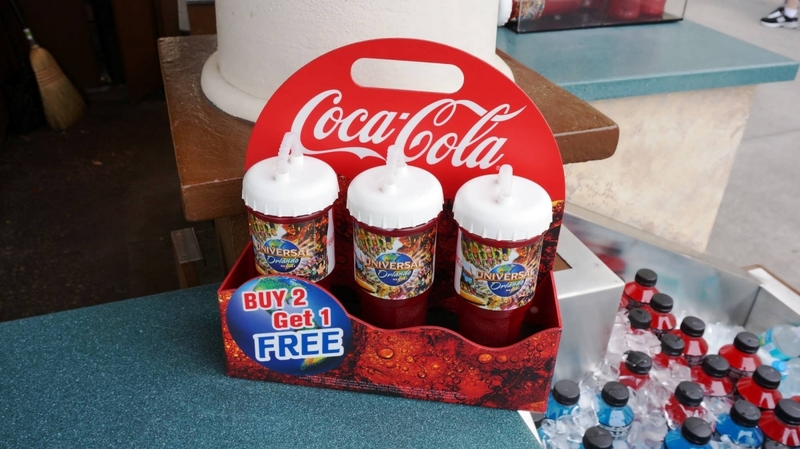 While visiting a theme park is always an expensive proposition, there is definitely one way that Universal helps take the pressure off of your wallet or purse – its refillable cup, popcorn bucket, and Coca-Cola Freestyle programs. 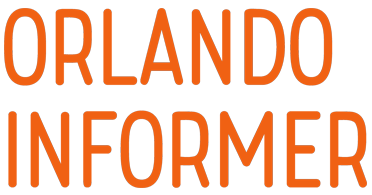 Even though these are popular and heavily-used deals, guests consistently have questions about them due to some significant changes over the last few years (and just some general misinformation that’s still floating around out there). The purpose of this page is to explain each program in full and let you know how to best take advantage of it! 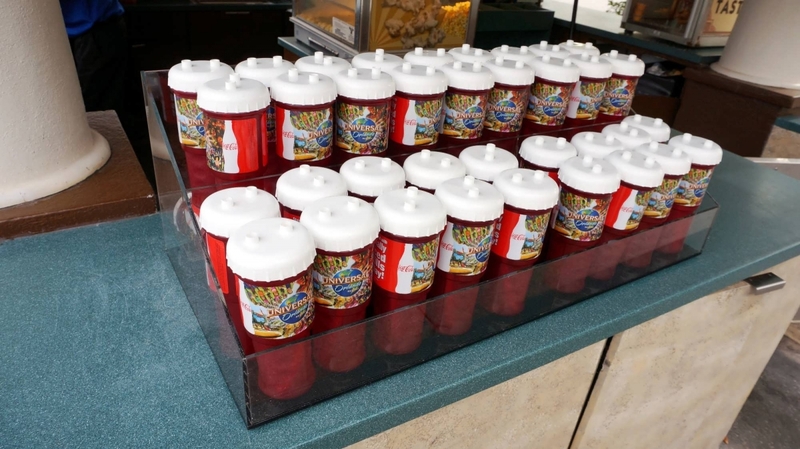 Because Universal’s refillable popcorn bucket and souvenir cup programs have been around for years (in one form or another), we will explain them first, and then we’ll jump to the newer Coke Freestyle program right afterwards. 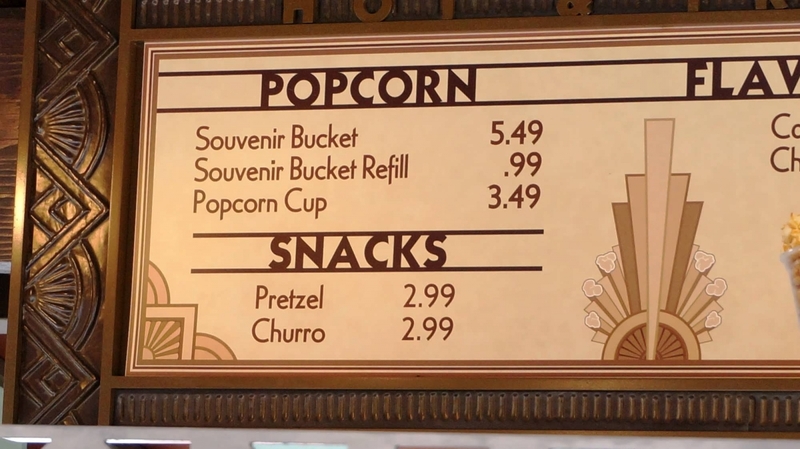 In this refill show, there are three stars: a souvenir popcorn bucket, a souvenir cup (that is a Tervis-esque tumbler), and souvenir sippers (which are themed to one particular character or another). 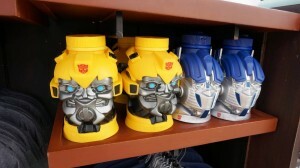 You can purchase them all at many locations throughout Universal’s theme parks – the popcorn bucket costs $8.99, plus tax; the cup, $16; and the sippers come in at $16 for one and $25 for two. 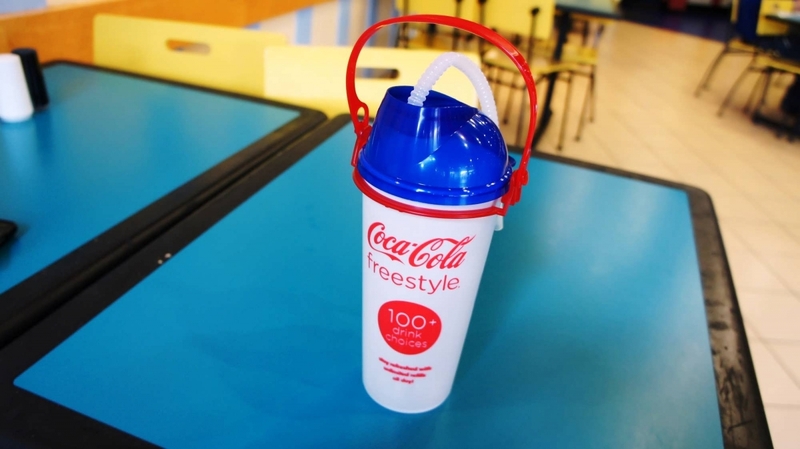 The insulated souvenir cup, meanwhile, has a bit of an extra ability, if you will – it can also be used for the Coke Freestyle program, which we’ll get into in just a bit. For the time being, all you need to know is that it more or less acts the same as its souvenir sipper counterpart. 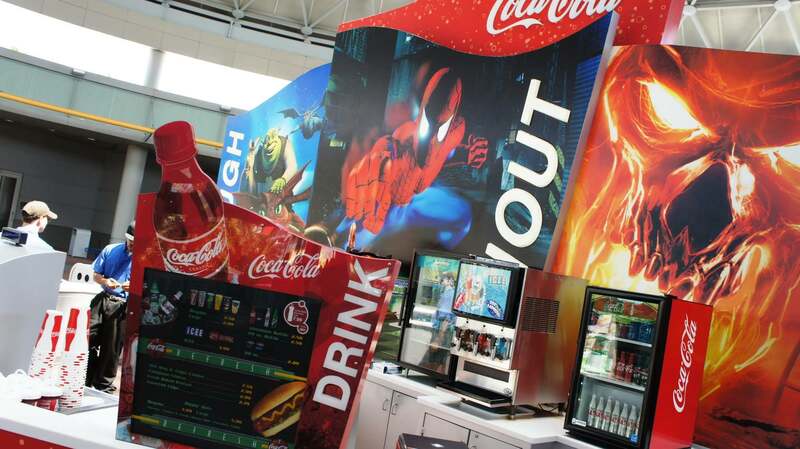 We say a “general” rule because, of course, there are a few exceptions – some counters that don’t have the red sign will still give you discounted soda refills. 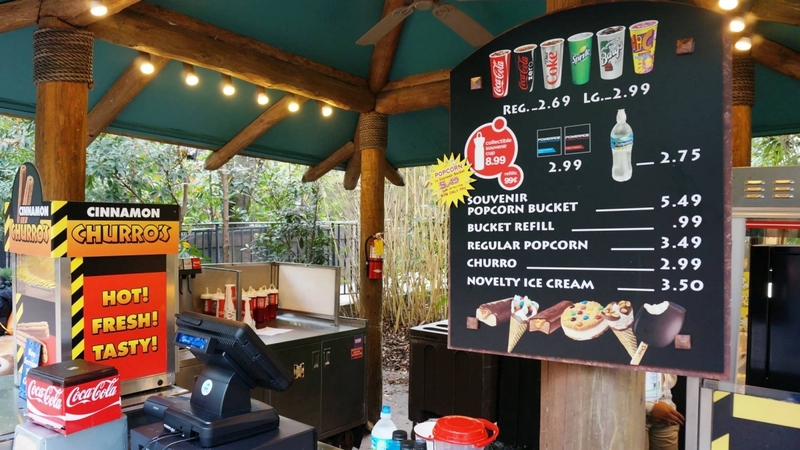 The bottom line is this: if the venue is inside the theme parks and it sells fountain drinks, you should be able to get a discounted refill – just ask! Does my Butterbeer mug count? Good question, and the answer is yes, it does. 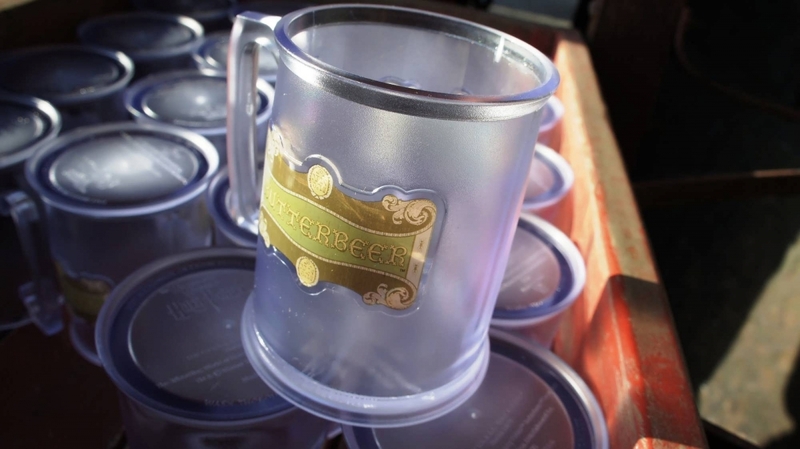 If you purchase a souvenir Butterbeer mug, it can be used for discounted soda refills at all the same locations as the refillable cups. Can I use my souvenir cup for discounted Butterbeer refills? Can I use my souvenir cup for discounted refills of Pumpkin Juice, Pumpkin Fizz, Fishy Green Ale, etc.? We’re sorry to say it, but you cannot. Pumpkin Juice, Pumpkin Fizz, and the other “branded” Harry Potter drinks are always full price, just like we described above with Butterbeer – so, even if you have a souvenir cup, you pay what everyone else pays. 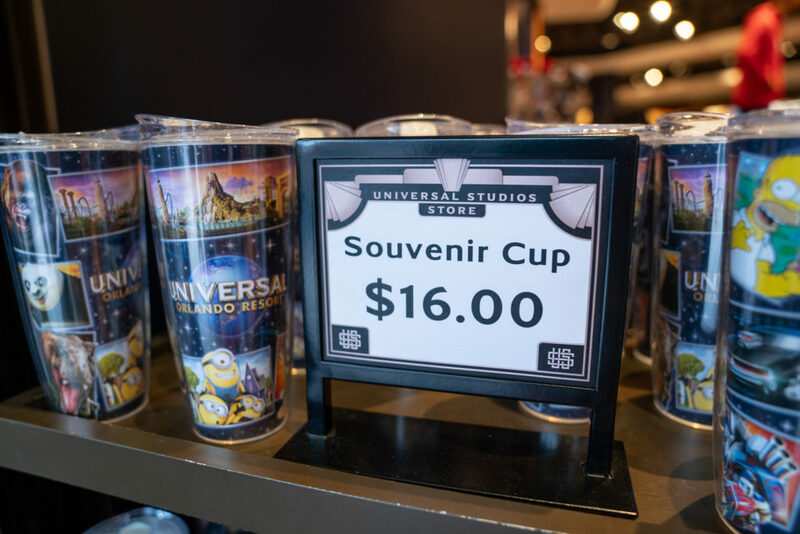 However, you can use your souvenir Butterbeer cup or any other souvenir mug for discounted refills on the generic beverages sold inside the Wizarding World, which include tea, lemonade, and cider. What can you tell me about the Hog’s Head mug? Can I use it for discounted refills? But we’re afraid we’ve got more bad news: this mug cannot be used for discounts on anything, period – no draft-beer refill discount, no soda refill discount, no anyhing. 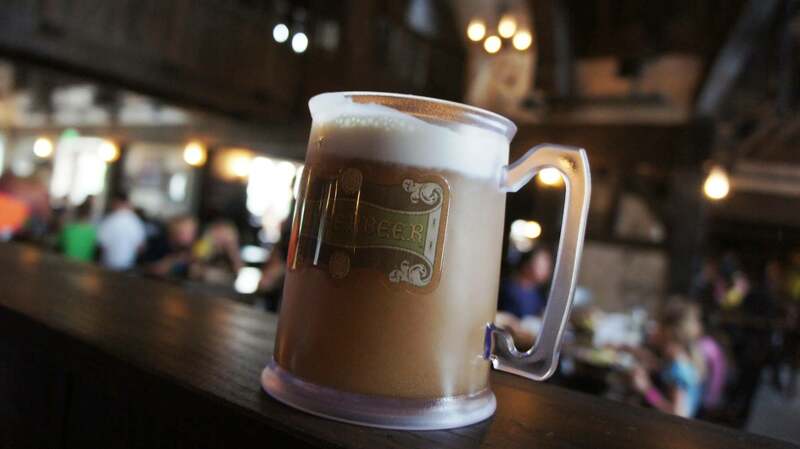 In addition, you cannot order a Butterbeer at Hog’s Head and get it in a Hog’s Head mug instead of the regular Butterbeer mug (turns out that the Hog’s Head mug is actually bigger – 20 ounces versus 16). 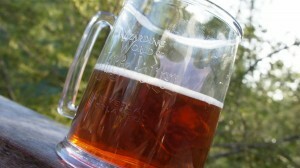 So, is there any point in paying $11.49 with tax to get a Hog’s Head mug if you don’t care about the beer? 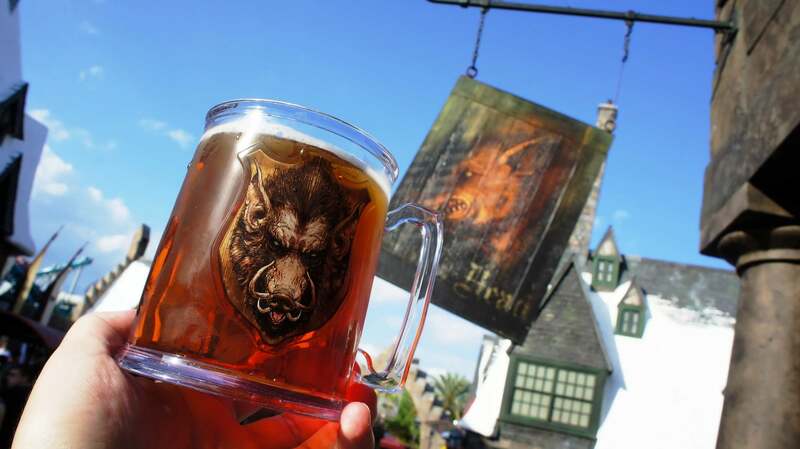 About the only reason we can suggest is that the Hog’s Head mug has the cool Wizarding World of Harry Potter insignia, but it is a bit tough to see. The Butterbeer souvenir mug just has the Butterbeer insignia on both sides. Can I get discounted refills on the Simpsons specialty drinks? 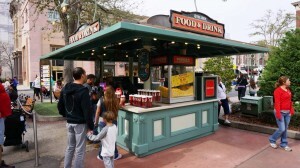 At The Simpsons‘s Fast Food Boulevard, you’ll find a slew of specialty drinks, including Buzz Cola and Flaming Moes. 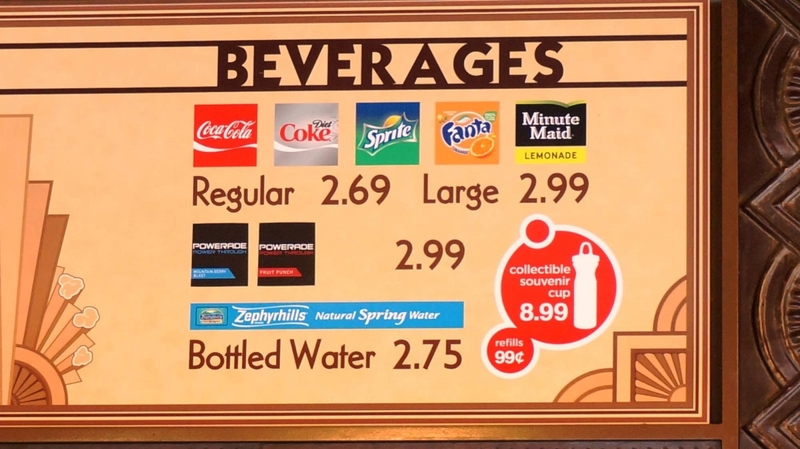 However, like you’ve seen with the Wizarding World of Harry Potter, the “branded” Simpsons drinks are not available as part of the discount refill program. But do keep in mind that Coke soda fountain drinks are served at Moe’s Tavern and all the Fast Food Blvd venues, so you still have a chance to get a discount soda refill. What else can I get discounted refills on with the souvenir cups? Soda is what you need if you only want to pay $1.49 plus tax for a refill. 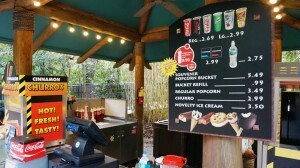 However, with a souvenir cup, you can get a percentage discount on a few other beverages around the park. 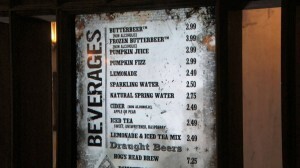 As we mentioned above, inside the Wizarding World you can get discounted refills of tea, lemonade, and cider. 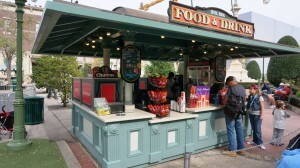 Outside of the Wizarding World, discounts are also available for slushies and Icees. So, now we bet you are wondering: “Well, can I get the same slushy discount using one of the souvenir cups?” Yes, you can. 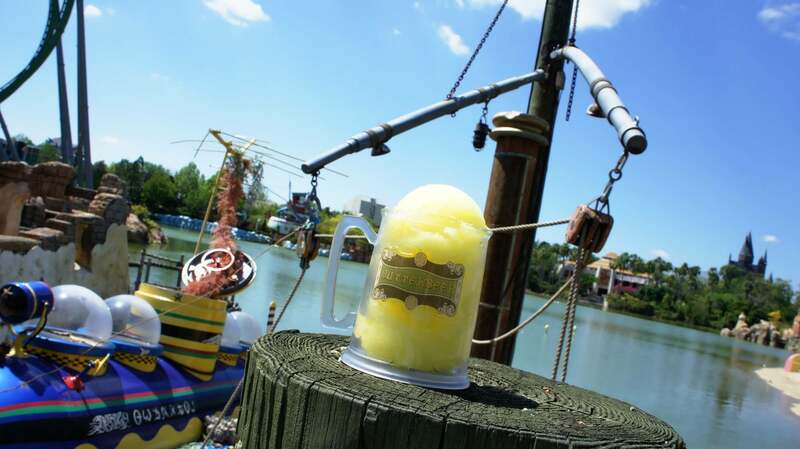 You’ll get five scoops of lemon slushy goodness, and you’ll be charged the same as with the Butterbeer mug. 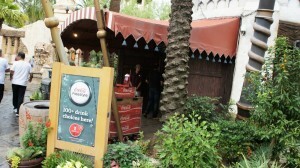 If you are looking for a deluxe iced beverage, then head to a stand selling Icees. 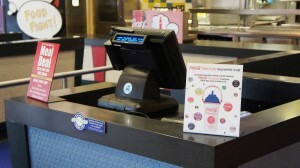 You can get your entire cup refilled with a blue or red Icee for a dollar off the regular price. Do I have to pay if I just want water? Nope – you don’t have to pay anything for water refills, so this is a great way to save money and actually get some hydration for your body. 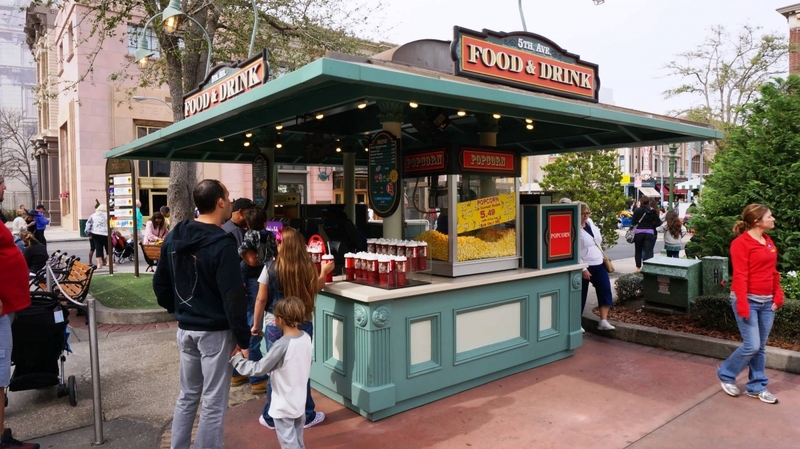 You can get free water refills at about most beverage carts and kiosks, all restaurants, and any of a dozen water fountains around the park – plus, you even get free water refills using any cup at the Coke Freestyle machines. Keep in mind that you’re getting what may be referred to as “tap water,” not bottled water, but, on a hot day, it’ll taste just fine. Or bring a water enhancer like MiO or Crystal Light Liquid to make that free cup of water even better! 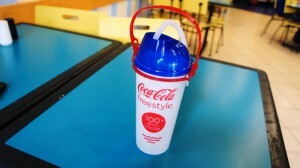 Can I use my Coke Freestyle cup for $1.49 refills? We haven’t talked much about Coke Freestyle yet, but in case you’ve studied ahead, you may be wondering if you can use a Coke Freestyle cup for $1.49 refills; after all, we did say that a good rule of thumb is, if you paid more than $8.99 for your non-alcoholic beverage cup, you will be able to use it for discounted refills. Unfortunately, the answer is no. Universal has made a policy decision to keep the two programs separate. For those who have studied this topic in the past, please note that this is a more recent change. How does the Universal Dining Plan fit into all of this? 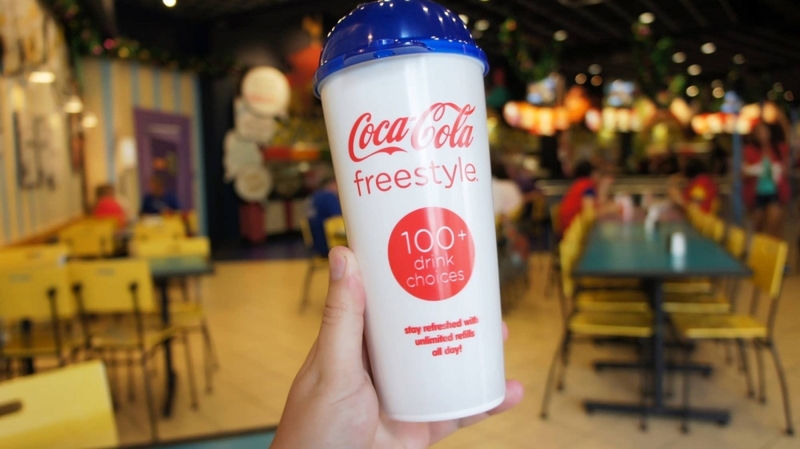 Universal offers a permutation of its Dining Plan – Quick-Service that is called Dining Plan – Quick-Service + Coca-Cola Freestyle, which, strangely enough, incorporates a Freestyle cup into the proceedings. 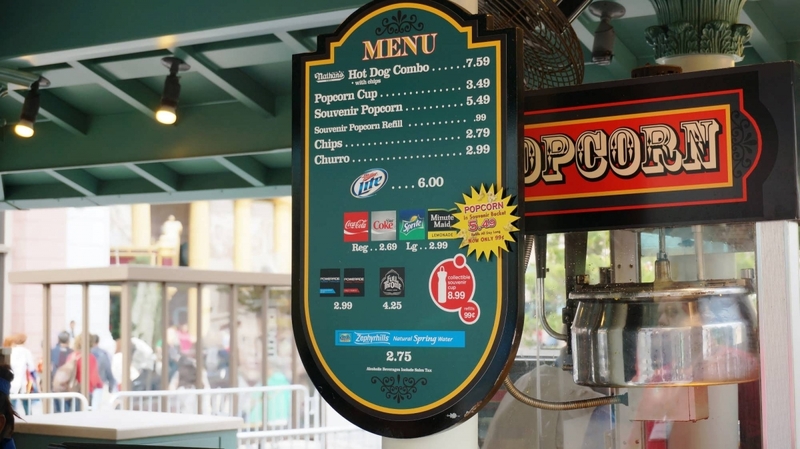 For six dollars more than the standard quick-service plan, guests replace their one extra non-alcoholic drink with the Freestyle cup, allowing for unlimited refills that day (this is the “best value,” Universal states). 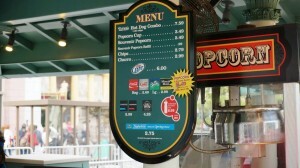 If you’d like to learn more about Universal’s dining plans, click here. 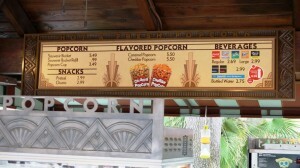 Can I get “flavored” popcorn at the discounted rate? Oh, you’re getting hungry again? 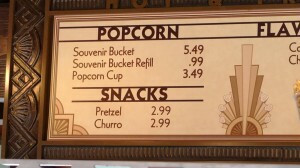 As you recall, the souvenir popcorn buckets can be refilled for $1.99, plus tax. However, this rate is just for the standard buttered popcorn coming out of the big machines. Universal also sells flavored popcorn, like caramel and cheddar, at a few spots around the parks, but if you want to splurge on flavor, you’ll need to pay full price. Can I use the souvenir popcorn buckets and cups I buy at one theme park over at the other? 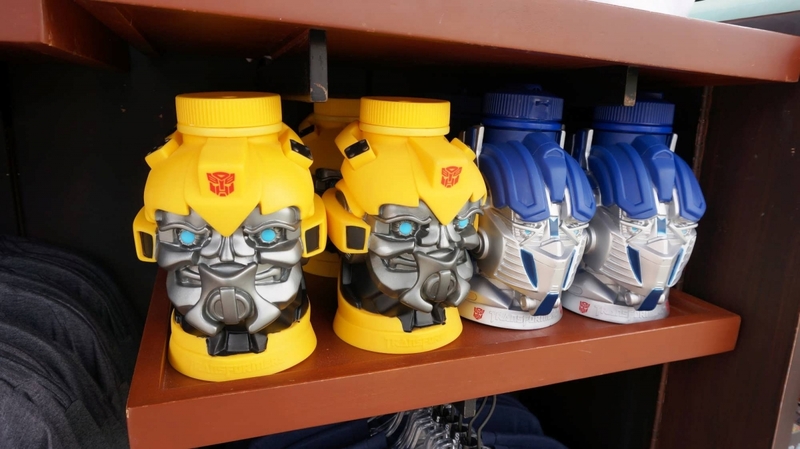 Universal’s new water theme park does offer its own refillable cup, but it doesn’t have any popcorn machines, so bringing your popcorn bucket won’t get you anything (unless you want to make sand castles with it). 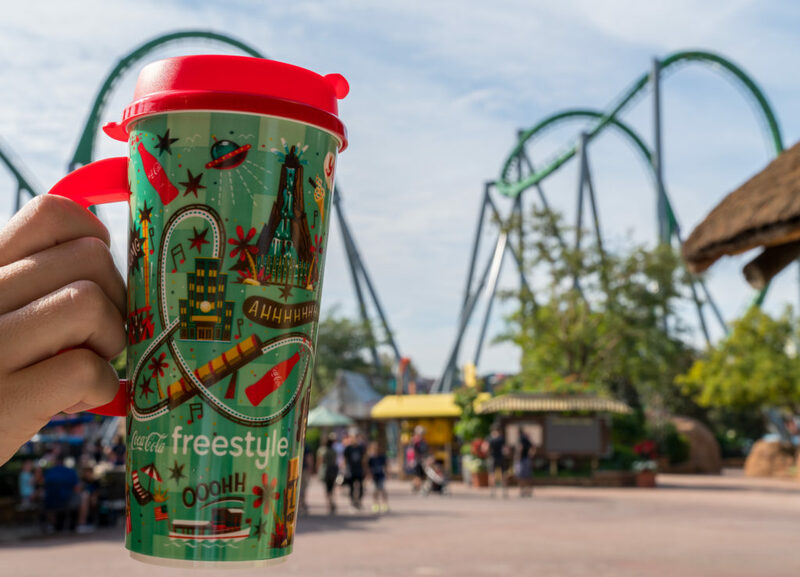 It should be noted, however, that a Universal Studios Florida or Islands of Adventure refillable cup can work at Volcano Bay, or vice versa, so that’s definitely something. 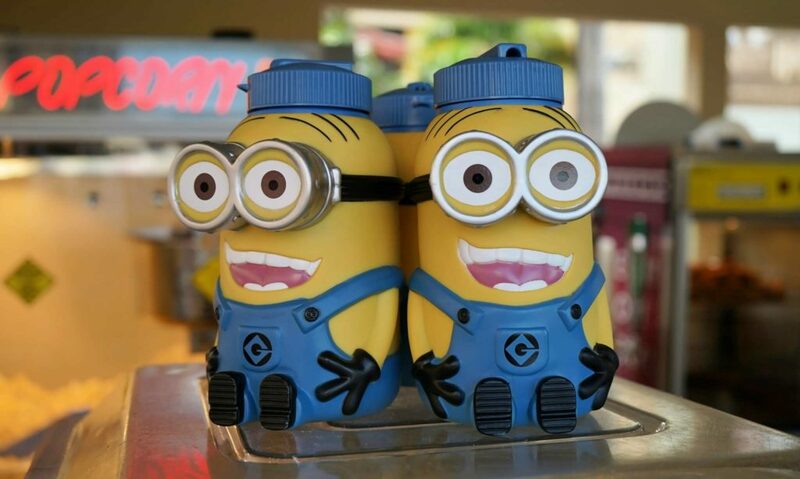 Can I get refills at CityWalk or the on-site hotels? 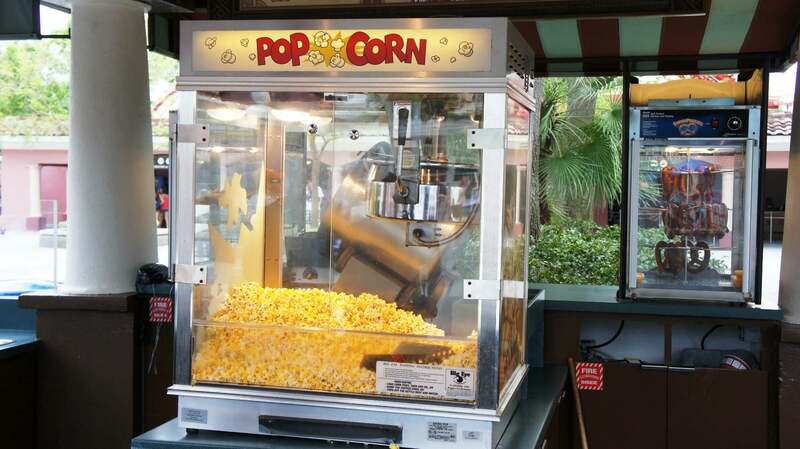 However, there are no discounted popcorn refills at CityWalk, nor are there discounted refills of soda or popcorn at Universal’s on-site hotels. 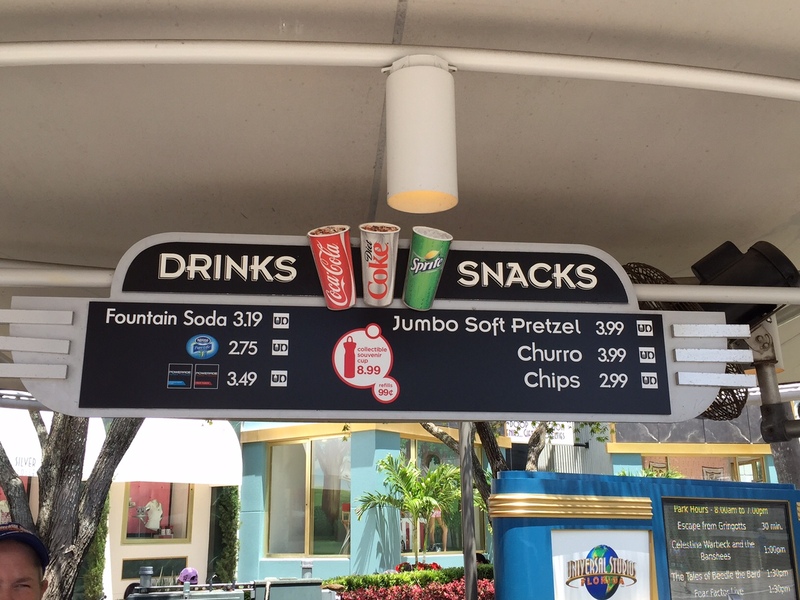 We should note that the most recent properties – Cabana Bay Beach Resort, Sapphire Falls Resort, and Aventura Hotel – do have their own soda refill programs, but their cups do not work for discounts anywhere at Universal’s parks or CityWalk, and vice versa. What if I need a new straw or lid? Universal will replace straws and lids at no charge. Just ask at a participating concession stand. Are the cups and buckets dishwasher-safe? It depends. 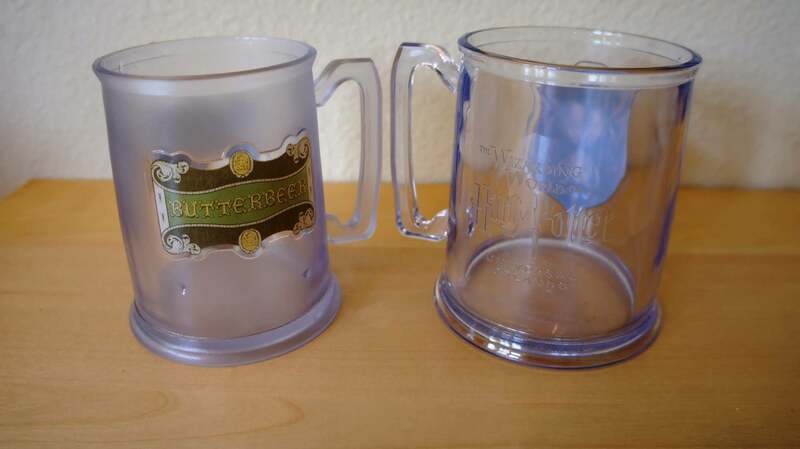 The tumbler souvenir cups certainly are dishwasher-safe (top-rack only), but all the other cups seem to be hit and miss; we’ve washed, for example, the Butterbeer mug and popcorn bucket in our dishwasher multiple times, but other fans have had melty experiences. So, if you want to be safe, hand-wash these items. 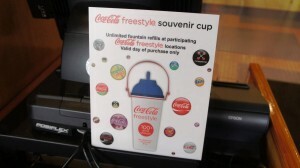 The Coke Freestyle program, like the classic souvenir soda cup program described above, is quite simple on the outset. But, again, once we start digging into the details, it gets a little sticky. So let’s talk about what, exactly, Coke Freestyle is, how Universal’s refill program works, and how it compares to the classic souvenir cup program. 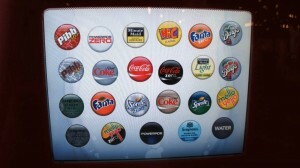 First, what is Coke Freestyle? 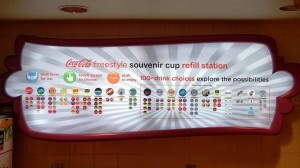 Basically, what Coke has done is create a super soda fountain machine, stocked it full of dozens of drink products, reduced the nozzles down to a single dispenser, and given you full control to fill up your cup as you please. The Coke Freestyle refill program features different pricing points. If you want to purchase one, it will cost you $15.99, plus tax. If you purchase two, it will cost you $14.99 each, plus tax. Finally, if you want to purchase three to six, it will cost you $12.99 each, plus tax. All of the cups must be purchased at once to receive the discount. 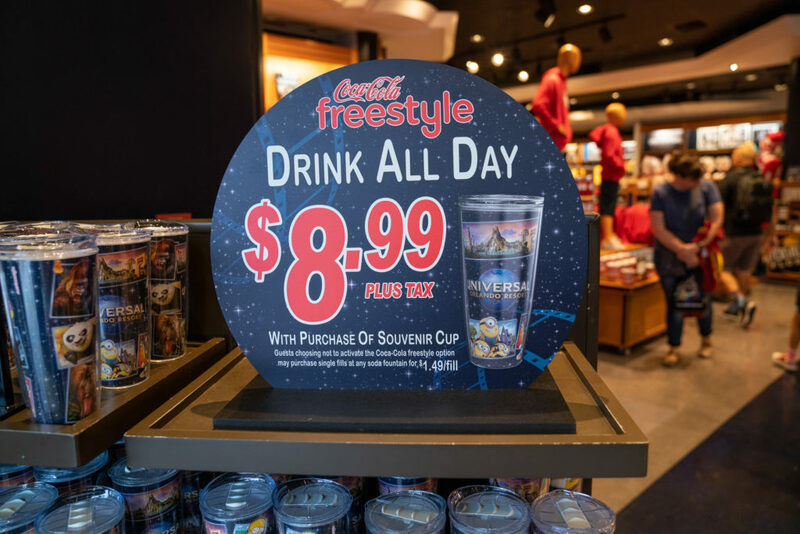 No matter how many cups you choose to purchase, the cup(s) entitles you to unlimited free refills at any Coke Freestyle station at any of the three parks for the day. If you already have a cup, extra days are $8.99, plus tax. 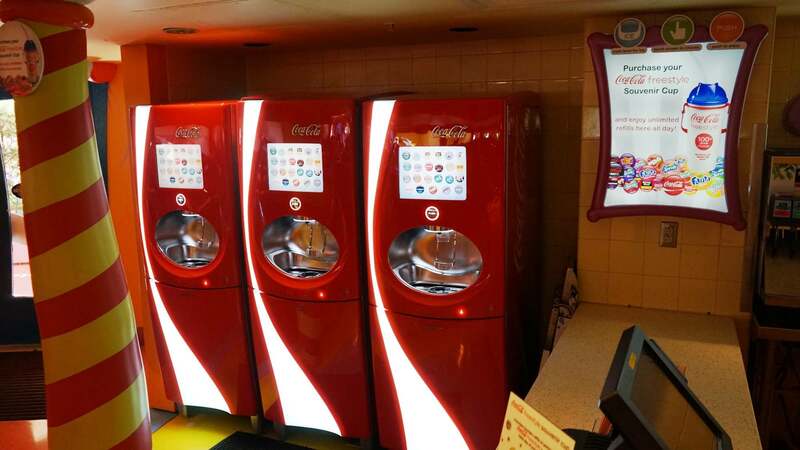 We’re sure you’re wondering exactly what you can dispense from one of these Coke Freestyle machines. 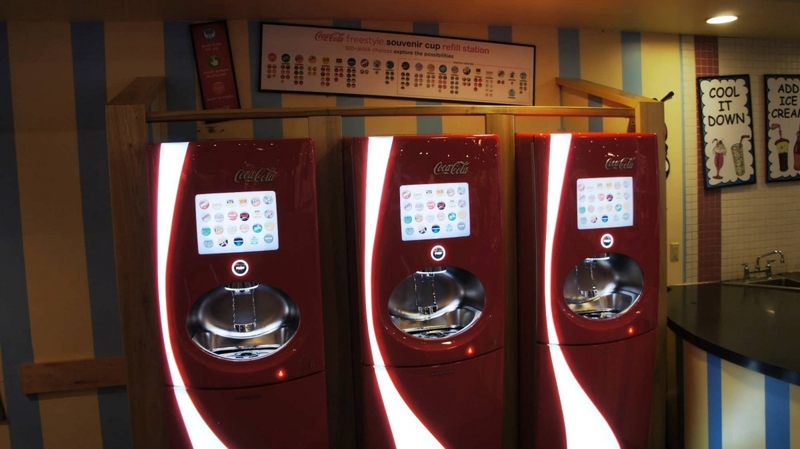 Well, believe it or not, there are simply too many options to list here, but you can learn about it all on the Coke Freestyle website. Now, it’s time to circle back ’round to those Tervis-esque souvenir cups from before. 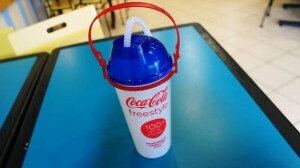 Remember how we said those could be used as Coke Freestyle cups, too? 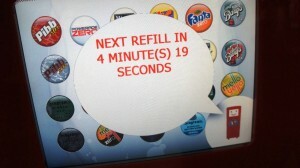 Well, they can, but with one important caveat – it’ll cost $8.99 to activate the refill option not only on each subsequent day, but also on the first one, as well. 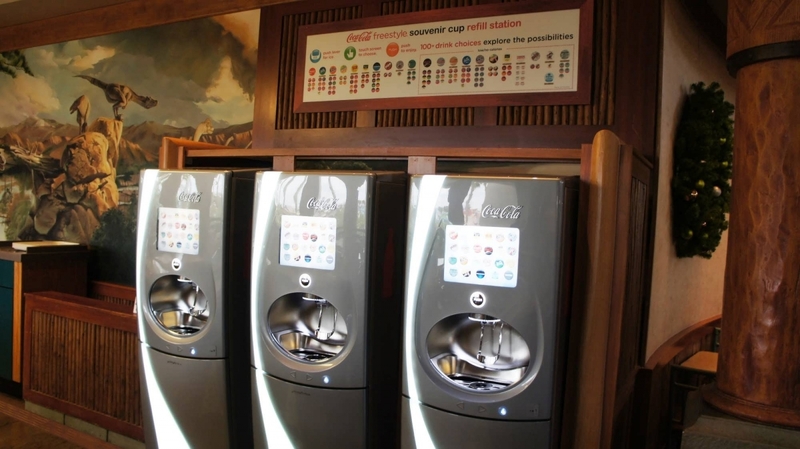 Update: beginning with the 2015 season, Coke Freestyle is available during Halloween Horror Nights. In Universal Studios Florida, there is one near Men in Black: Alien Attack and just before both sides of London. 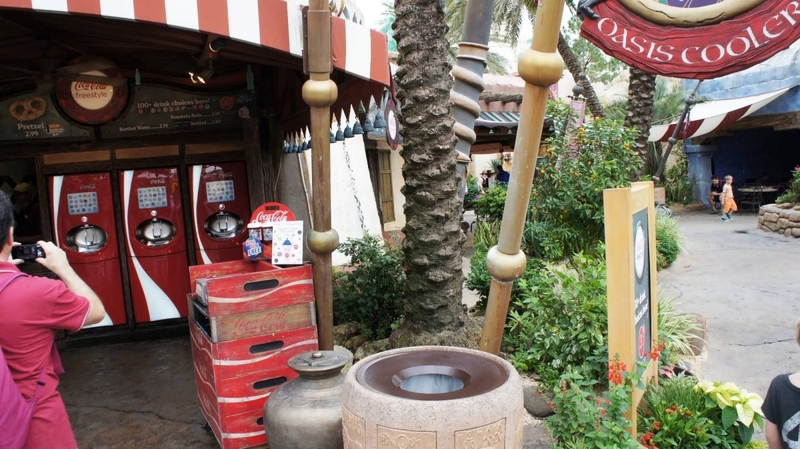 In Islands of Adventure, there is also one at the end of Port of Entry at the dining reservation cart, and Cool Bones in Jurassic Park. It’s worth noting that there are no Coke Freestyle stations inside The Wizarding World of Harry Potter (Hogsmeade or Diagon Alley), The Simpsons‘s Fast Food Blvd, or any of Universal’s full-service restaurants. 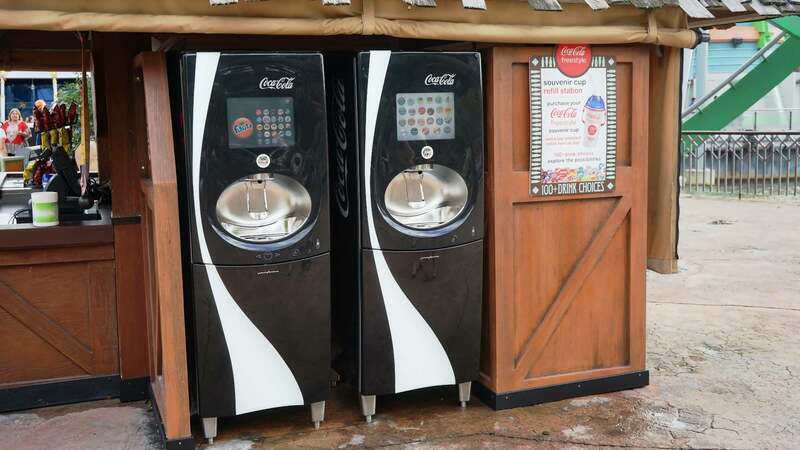 In addition, there are no Coke Freestyle stations at CityWalk or any of Universal’s on-site hotels (at least, that work with the in-park program). 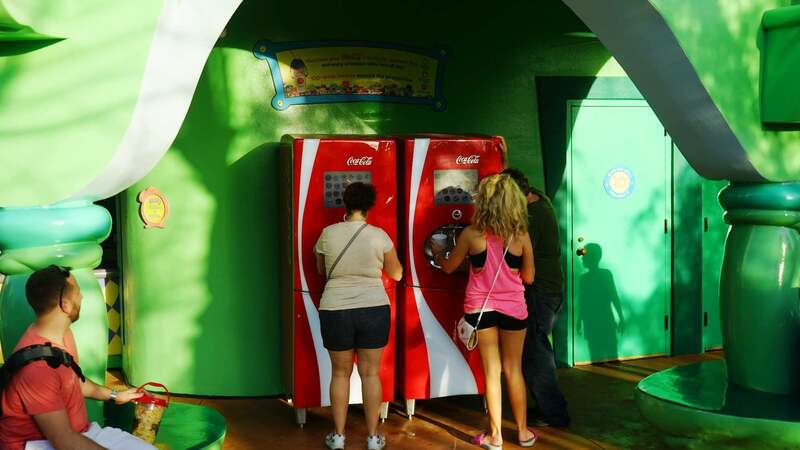 But, aside from these areas, you will never be too many paces away from the next Coke Freestyle station as you’re walking around the parks. I can really only use the Coke Freestyle cup for the day? We say “yes” because the Coke Freestyle cups can only be used the day you purchase them for free refills at the Coke Freestyle stations. Universal is able to track this because each cup has an RFID chip inside it (RFID stands for Radio Frequency Identification). 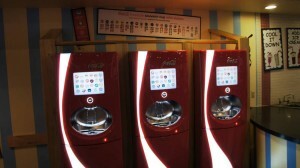 The first time you use your cup, the Coke Freestyle station registers it using the RFID chip for use that day. If you return days later with the same cup, the station will read the chip, see that it’s expired, and it will not dispense what you desire. When using the Coke Freestyle stations, yes, they are. Unlike the classic souvenir soda cup program, in which you pay $1.49 for a refill, with the Coke Freestyle cups you get unlimited refills at no additional charge. Better yet, you don’t have to wait for a Universal team member to fill the cup – you can just walk up to any Coke Freestyle station and do it yourself! But won’t it be a madhouse waiting in the Coke Freestyle line? It can be sometimes, yeah. Interestingly enough, given the benefits of this program and the freedom of the Coke Freestyle concept, these cups weren’t immensely popular at first – but you better believe that, over the years, guests have been noticing the Freestyle refills, and they’ve been taking advantage of it more and more. 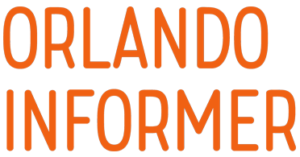 Our best piece of advice is to try and get your refills around the lunch or dinner rush, which will absolutely see lines at most, if not all, of the various stations. 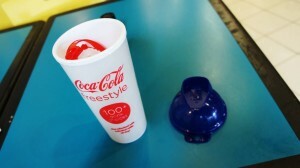 I don’t care about the “freestyle” part – I just want my Diet Coke straight. Should I skip Coke Freestyle? Just because you have a Coke Freestyle cup doesn’t mean you need to get all crazy with your drinks – you can use the machine however you’d like. So, if that means you just want to drink one product, not mixed with any others, you are “free” to do so. The advantages explained above remain the same. Since I refill my Coke Freestyle cup myself, can I just buy one and fill my friends’ plastic cups all day long? Nope… or, at least, not conveniently. 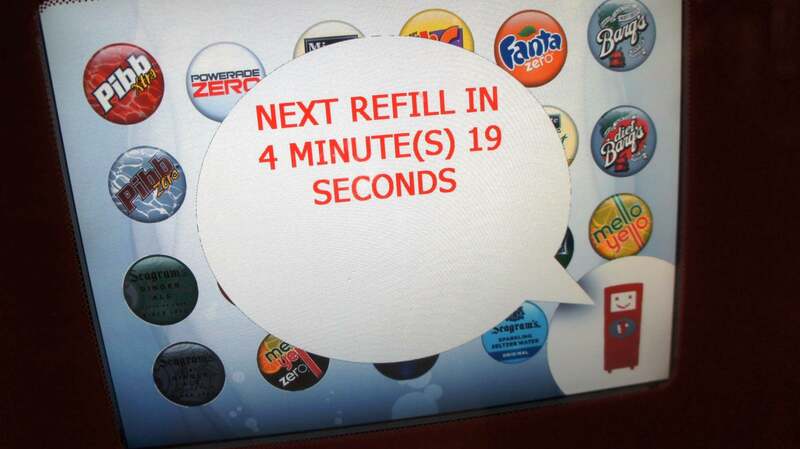 The machines track when you fill your cup, and once your refill is done, you have to wait 10 minutes before you can use any of the machines again. Once the 10 minutes is up, you can get another free refill – so, if your group is willing to wait 10 minutes a time for refills, then we suppose you could share. But we don’t know how long you’ll really want to be hanging out in the restaurants. 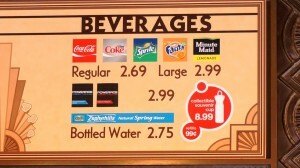 If refills are free, why would I ever want to purchase the classic souvenir soda cup? And that, our friends, describes the major decision you must make between the programs. With Coke Freestyle, you don’t have to pay for refills and you get to use their groovy machines to blend the perfect drink. But your refill locations are not overly abundant, and you only get one day of refills with your initial purchase. With the classic souvenir cup program, you do need to pay for individual refills, but you can get those discounted refills virtually anywhere inside the parks and CityWalk, and you can use the cups forever (again, until Universal changes the policy). 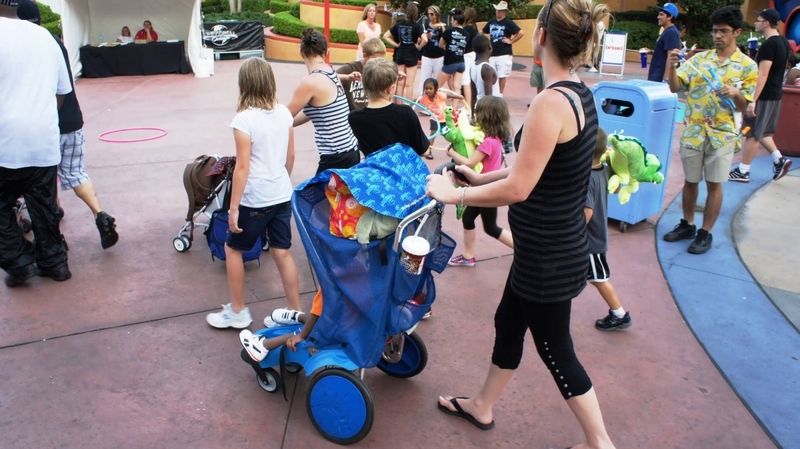 Whether you are visiting Universal Orlando’s theme parks once or for multiple times year after year, the refillable programs can work out to be a great deal. 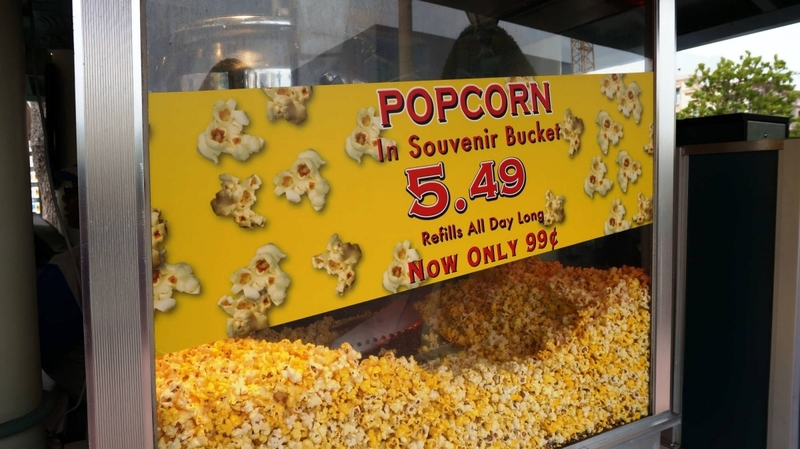 Now, should you really be drinking all that soda and eating all that popcorn? Well, that’s a discussion to have after you get home from vacation!